– Feature Article – Feelers: Do they Work? Feelers?1 What are you talking about? Well, do you know what automobile curb feelers are? These (largely obsolete) devices are spring-steel wires that protrude from underneath the car. They are positioned so that they extend just past the tires. When parking along a curb, the feelers contact the curb before the tires touch the curb. The feelers make a loud scratching noise which helps the driver park the vehicle without rubbing the tires on the curb (or parking too far away). Clearly, we don’t park pinewood derby cars. But we do like to avoid contact with the center guide rail. So, what if feelers were installed which prevented the wheels from touching the guide rail. Would the frictional loss due to the feeler contact with the rail be less than, or greater than the frictional loss of the wheels touching the guide rail? Well let’s run an experiment and find out. First, we must construct a car with feelers. I did this by first gluing a piece of wood onto both sides of the car. This extra wood is drilled to accept feelers. Next, I fashioned two types of feelers: (1) rolling bushings, and (2) thick nylon line. Figures 1 and 2 below show the rolling bushings. These consist of Awana axles (0.092 OD smooth axles) and #4 Flanged Nylon Bushings (hardware store item). I lubricated the bushings with a drop of thin film oil. The nylon line feelers are shown in Figure 3. I used 0.068 nylon line from a lawn edger. For both feeler types, holes were drilled in the wood extensions such that both feelers contact the guide rail just before the wheels, and prevent the wheels from contacting the guide rail. As shown in the photos, I used an extended wheelbase car with outlaw-style wheels. The outlaw wheels were chosen as they tend to produce the most consistent results. I aligned the car, and then made five runs without any feelers. Next, five runs were made with the Rolling Bushings, followed by five runs with the nylon feelers. This three step sequence was then repeated, except that due to the poor results, the nylon feeler runs were not repeated. The tests were run on a 32 foot Piantedosi anodized aluminum track. The results are shown in Figure 4 below. As shown in the data, both versions of feelers actually slowed down the car. After running these tests, it dawned on me that one of the big advantages of outlaw-style wheels is the minimal contact with the guide rail. (2) Therefore it is quite possible that the test results would have been different if standard BSA wheels were used. So, I prepared a set of BSA wheels, and repeated the tests with no feelers, and with the bushings. The results are shown in Figure 5. Apparently, the BSA wheels generate significant losses when they contact the guide rail, so much so that the bushings provide a big advantage. The testing indicates that when used with BSA wheels (and I assume any other type of standard profile wheel, such as PineCar or Awana), bushing-type feelers provide a significant advantage. But when using narrow profile wheels, the bushing are generally counterproductive. Are feelers legal? I have never seen a rule set that prohibited feelers. However, I strongly suggest that you either get a ruling from your officials before using them, or be prepared to remove them at the check-in. 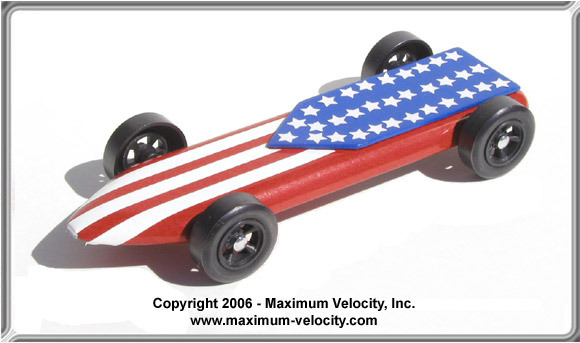 You never know when a pinewood derby official may decide to ‘legislate from the bench’! 1Sometimes, these devices are called ‘whiskers’. 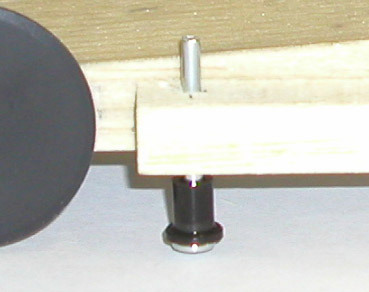 2Outlaw wheels contact the guide rail at the upper edge of the rail, resulting in less frictional losses than a standard pinewood derby wheel. Since we are out of submitted photos for the showcase, I thought I would share our cars from earlier this year. I built this car for my wife to run in the parent-sibling race. The body is an extended wing, which I modified with the side curves. 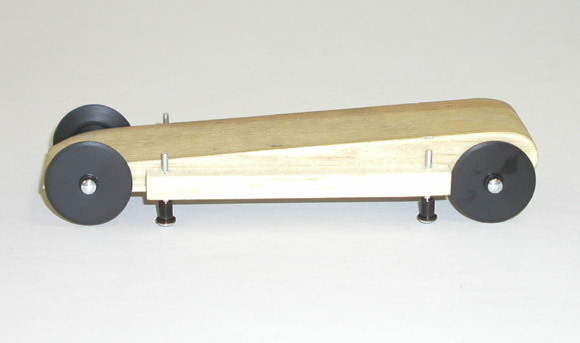 I also had to enlarge the weight pocket to account for the wood reduction and the light weight wheels. Using a drop of Krytox 100 in each wheel hub, the car took 1st Place for speed. My daughter, Janel, built the Stealth, and did all the decorating. The stars came form a craft store, and the pinstriping is a hobby shop item. The car took 1st Place for speed, and 2nd Place for design. My son, Stephen, built the Wing. The car took 2nd Place for speed. I’m afraid he will grow up with a complex, as he has never been able to best his sister in the derby! (just kidding). Fifth graders do not usually join Cub Scouts, but this kid did. He was a friend of a scout in my den; he joined in for a half year or so of fun before moving on to Boy Scouts. 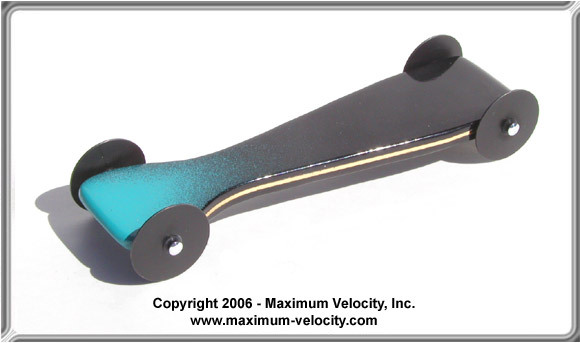 Having never seen a pinewood derby much less made a car, this was all new to him. He made a sleek sports car sort of design and painted it shiny silver. Nice job considering our cars are completely boy built in den meetings with nothing more fancy than a coping saw. Weigh-in night showed the little car exceptionally light, so he used what change I had on hand in my purse: a handful of pennies, nickels, dimes, and quarters that he could add to the car until it reached the magic 5 ounces – or nearly so. Masking tape held them on (kind of ruined the ‘look’ of the car, but what do you do?). Well this car came in 2nd Place in the den races, even though we had to keep adjusting the coins to hold them on. Time came for the main event where the top cars from each den raced against each other. Some cars were most definitely not boy-built, but engineer dad-built, and the boy’s car did not look to be the favorite. Guess what? It took 2nd Place in the pack. He was happy, and had done it himself! Keep it simple, make it fun. Isn’t that what it is all about? The smile on the boy says YES! What is the actual difference between Hob-E-Lube and Tube-O-Lube ? Last year I used Hob-E-Lube, but thinking about switching to Tube-o-Lube. Tube-o-Lube is ground finer, so less break-in is needed. Hob-E-Lube has molybdenum particles. In our testing, the presence of molybdenum slowed down performance. 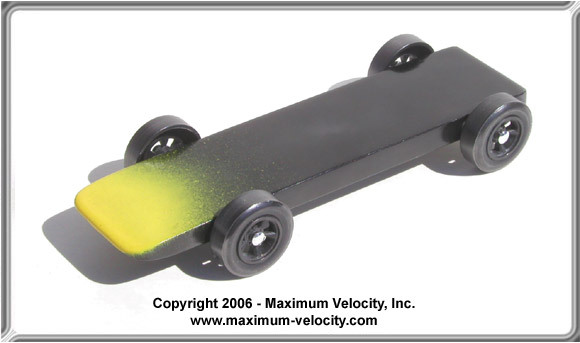 Moly is apparently an excellent lube for high-temperature, high-pressure, non-conductive applications, none of which apply to pinewood derby racing. We used to carry Hob-E-Lube, and switched to Tube-O-Lube after testing both products. I was wondering if you had ever built a car using springs? This may not be the kind of springs you were thinking of, but using coil springs would be a serious technical challenge. What diameter of wheel is best for speed? In general you want larger diameter, but lighter weight wheels. This is because larger diameter wheels require fewer revolutions to complete the track, and can spin at a lower RPM. There is an optimum diameter based on the geometry and weight of the wheel (provides the greatest mechanical advantage over friction). For “outlaw style” wheels, the optimum diameter is about 1.2 inches. For stock width wheels, the optimum diameter is slightly less.